In the wake of another round of talks underway between Iran and the P5+1 negotiating team of countries, there is emerging a pattern of perceived public support being built by those who support Iran and seek to see its quick re-admission to the international community without making any substantial concessions as part of any agreement. Many of these Iran apologists are seeking to build what can only be called a “wave of inevitability” towards a normalization of relations between Iran and the West. There has been a push by Iran’s global network of supporters to create a situation by ginning up a parade of officials, corporate representatives and news media who are speaking and acting on the impending possibility of the lifting of economic sanctions against Iran; even without a nuclear agreement in place. 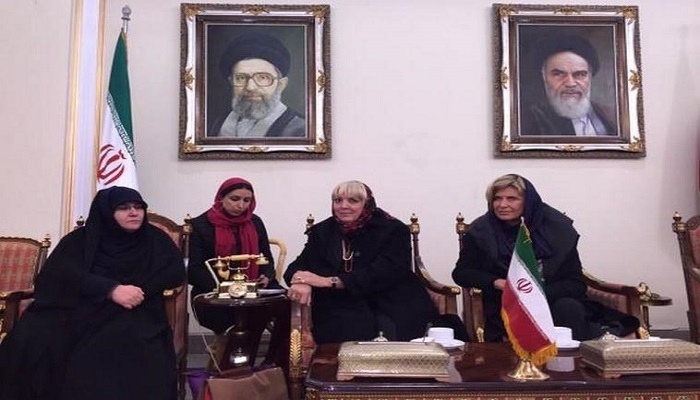 One glaring example of that effort was the recent delegation of German lawmakers who journeyed to Iran and decided to inappropriately meet with a Holocaust denier and another official implicated in the kidnapping of American diplomatic personnel back in 1979. A European-wide public interest known as Stop the Bomb, which is dedicated to halting Iran’s development of nuclear weapons, raised the alarm in Berlin over the German delegation’s meeting with Ali Larijani, the president of the Majlis parliament and a notorious Holocaust denier who defended then Iranian President Mahmoud Ahmadinejad and his own incomprehensible positions on the Holocaust. This comes on the heels of other recent overtures extended by Russian and European companies looking to cash in on the possibility of economic sanctions being lifted, as well as the infusion of upwards of $11.9 billion in frozen Iranian assets now being made available and transferred to Tehran’s accounts by the U.S. as part of the interim nuclear agreement struck by negotiators last year. The Iranian lobby hopes to build momentum on these various trends and create a perception that a deal is all but inevitable, thereby building more pressure on the West in the face of growing violent Islamic extremism which is ironically being spread by Iranian regime itself as part of its religious campaign to remake the Middle East in its own twisted image. Tried and true Iran apologists such as the National Iranian American Council have led the charge. The leader of the German delegation, Bundestag Vice President Claudia Roth, has already been widely criticized in Germany and internationally for her all too cozy relationship with Iran’s mullahs, culminating in an infamous high-five greeting of Iran’s then-ambassador to Germany Reza Sheikh Attar, whom Iranian Kurdish dissidents accuse of massacring Kurds during his tenure as governor of the Kurdistan and western Azerbaijan provinces in the 1980s. But what all of these disparate efforts on behalf of the mullahs in Iran fail to realize is the growing anxiety the rest of the world is feeling towards violent extremism and the negotiation fatigue setting in amongst international capitals and news media as yet another round of talks take place with no hope of agreement coming into focus as long as Iran’s Supreme Leader Ayatollah Ali Khamenei and his handpicked puppet, President Hassan Rouhani, publicly denounce making any concessions to the West, which sank the two previous sessions. The regime in Iran has never expressed any desire whatsoever to not only meet the International terms on nuclear reduction, but has never even uttered any inkling of improvements to its dismal human rights record at home and its sponsorship of terror abroad.